County Clare’s reputation as Ireland’s Capital of Traditional Music gained further lustre with Fleadh Nua taking over the town of Ennis for the last 9 days. Visitors from Australia to America and all points in between joined with the inhabitants of the town – the Festival’s natural home since 1974 - for an unparalleled celebration of traditional entertainment. One of the reasons why Fleadh Nua 2010 is destined to pass into lore as one of the all time great Fleadhanna, was the sheer brilliance of the performers on view at he various concerts. Attending the Celebrity Concert last Saturday night was akin to watching “Reeling in the Years” on television. This Pádraic O’Reilly produced Concert brought together performers who had featured in past Aos Óg Concerts and was bound to be a special occasion. Piper, Eoin Ó Riabhaigh –accompanied by Cyril O’Donoghue – and his fellow Corkonians, Conal Ó Grada on Flute and Colm Murphy on Bodhrán lent an “exotic“ air to what was essentially a celebration of the vibrant music scene in Ennis and Clare that obtained in the 1970’s. So we thoroughly enjoyed the Cotters – Eamonn on Flute accompanied on the Piano by Geraldine. We delighted at the wholly unexpected - but all the more welcome - sight of John McMahon on the Concertina sharing the stage with his brother, Séamus on Fiddle and Flute – most ably accompanied by Accordionist, Kieran Kissane and Geraldine Cotter also joining in. We marvelled at the wonderful tin whistle duet of Paul Roche and Helen Murray. On a personal note, the writer quite literally gawped open-mouthed at Kieran Hanrahan’s dexterity on the Banjo while Mike Hanrahan’s singing and song-writing skills were warmly received by the audience. Barefield’s own, Mary and Josephine Nugent lent a cerebral air to proceedings with a bravura display of Flute and Fiddle playing. Concertina Maestro, Noel Hill and his daughter, Aisling thrilled the audience with their music and repartee. Edel Vaughan and Anthony Sharkey – Aos Óg performers of a more recent vintage – also lent their considerable vocal and dancing prowess respectively to the Concert. All of the musicians assembled on stage for a rousing rendition of “The Humours of Tulla” and “The Bucks of Oranmore” at the end of the night – a finale that will live long in the memory of all those in attendance. Clare County Arts Office and co-ordinators, Liam and Finola Ryan deserve the height of praise for the fantastic “Riches of Clare” series of lunchtime concerts – the line-up for which constituted a veritable who’s who of the Traditional Music World. Kevin Crawford and the lads from Lúnasa turned in a powerhouse performance at their late night gig in Glór. On the evidence of this showing, “Lá Nua” – Lúnasa’s latest release - is quite simply a “must-have” addition to everyone’s C.D. collection. They were supported by local group “Socks in the Frying Pan” – whose singular musical ability and vocal talents mark them out most definitely as ones to watch for the future. Having joined Lúnasa for a couple of tunes on Friday night, Tola Custy was back in Glór on the following night as he teamed up with Pádraig Rynne, Sylvain Barou, Paul McSharry and Karol Lynch for Guidewires’ late night party. And what a great gig it was. As well as its musical and dancing prowess, County Clare can also boast of a rich heritage of Traditional Singing. The Singing Sessions at this year’s Fleadh Nua acknowledged five of the county’s best known exponents of the art who sadly are no longer with us namely Ollie Conway, Denis O’Sullivan, Joe Kierse, Michael Mahony and Peadar Crotty. The use of recordings – collated in a most masterful and sympathetic way by Joe O’Connor, Reachtaire, C.C.É. - combined with the stories and reminiscences of their fellow singers ensured that neither the voices nor memory of these fine singers have been stilled with their passing. 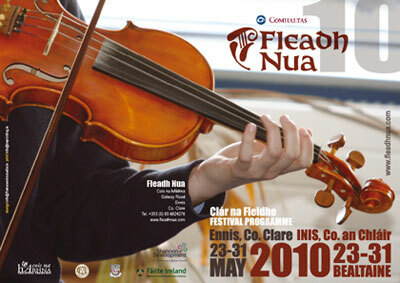 The unique nature of the series was commemorated by the presentation of Gradaim Cheoil – the highest honour which the Fleadh Nua Committee can bestow – in memory of the outstanding contribution and lifetime commitment which these men have made to the Singing Tradition of County Clare. At the Aos Óg Concert the spotlight shines on the cream of our young Musicians, Singers and Dancers. Thankfully, County Clare’s pre-eminence in the Traditional World appears to be secure for many years to come in view of the virtuosity on display at this year’s concert which was produced by Marie O’Byrne. While it is invidious to pick out one act from such a great night, mention must be made of John Fennell’s young set dancers who brought the house down with their performance. Having identified a need to make our Traditional Arts more accessible and more visible to the wider community, Fleadh Nua has made great strides in recent years in fulfilling these objectives. The screenings of “Last Night as I Lay Dreaming” – a documentary on the life and songs of the legendary, Robbie McMahon – added an exciting element to the presentation of our Traditional Arts which was extremely well received by a rapt audience. Frank Custy took advantage of the fine weather at the start of last week so as to conduct the Foinn Seisiún Workshops on the lawn of the Old Ground Hotel – much to the enjoyment of both participants and onlookers alike. An extensive programme of Outdoor Entertainment over the weekend featuring groups as diverse as the Carrigkerry Wrenboys from County Limerick, Pipe Bands from Templemore, Fermoy and Tulla, Grúpaí Cheoil from Counties Wexford, Limerick and Clare and the award winning “Blonde’s Session Group” from Miltown Malbay meant there was no escaping Traditional Music, Song and Dance throughout the narrow streets of Ennis. Fleadh Nua introduced Traditional Music to the town’s bustling Café Society with the Cupán Ceoil Sessions. With a plethora of Céilithe and Pub Sessions there really was music morning, noon, and night at Fleadh Nua 2010. While the programme of events featured some innovative aspects like “The Banjo Strikes Back! !” Session, old favourites like Seanchaí extraordinaire, Eddie Lenihan and An Comórtas Rince Náisiúnta – featuring a record 84 performances from dancers from Kerry to Newry – continued to attract popular interest. Leeds Comhaltas Branch saw off the challenge of a gallant group from Carna so as to claim honours in the Senior Pléaráca Contest. The Junior Pléaráca title went to Craobh na Coradh under the direction of Mary Liddy. Fleadh Nua has always prided itself on the family-friendly nature of the festival. Mindful of the difficult economic circumstances in which many people find themselves at present, it is pleasing to report that 37 events – out of a total of 62 – were free of charge with the remainder being extremely reasonably priced. Fleadh Nua’s better value beats them all, no less!!! The passing of some of Fleadh Nua’s most dedicated and loyal supporters since last year meant that this year’s Festival was inevitably tinged with sadness. Nevertheless, the Organising Committee redoubled its efforts so as to ensure that Fleadh Nua 2010 would be one of which they would be proud. For there could be no more fitting tribute to the memory of our absent friends – ár gcumainn go buan – than to hear it said: “Wasn’t it a mighty Fleadh?” And thankfully, it was.